Chop all vegetables and place in pre-heated slow cooker. Add tomatoes, butter beans, spices and a bay leaf. Add 600 ml of boiling water. Cook on high for 1 hour then turn down to low for a further three hours. When vegetables are cooked, add 2 tsp water to cornflour and mix, add to the vegetables and allow another 30 minutes cooking. This was delicious despite not having the butternut squash; nor thickening with cornflour. I found there was still one serving left over. Definitely one to make again. 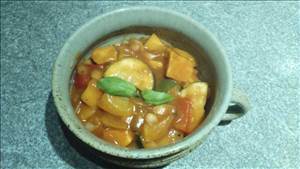 There are 360 calories in 1 serving of Spicy Bean & Vegetable Stew. Calorie Breakdown: 4% fat, 79% carbs, 17% prot.